Top Notch Material: Dreft is No Longer JUST Laundry Detergent! 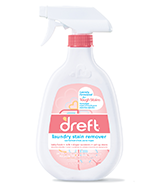 Dreft is No Longer JUST Laundry Detergent! We moms know about Dreft. It's like the ONLY laundry detergent to use the first few months of your babies life, right? Well, Dreft has recently expanded their line and they are no longer JUST about detergent. I was lucky enough to receive the all purpose cleaner, the stain remover and all purpose wipes! I am in love with all of the products that we received. I have been using the All Purpose Wipes daily to wipe down my counters and table after dinner. I love that it has very gentle ingredients that are safe enough for a baby, but is also a very effective cleaning agent! 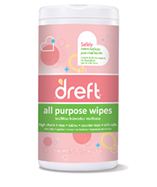 Dreft Gentle Clean Multi-Surface Wipes go wherever little ones may wander. They’re pre-moistened and formulated for babies to swiftly clean any surface they get their hands on. Toys, glass, counters. Use your imagination. Then go wipe down whatever you imagined because baby is probably touching it. The All Purpose Spray works just as well as the wipes, and I love using it on my stove after I clean or to clean my little ones toys when I am on a disinfecting kit! A little truly goes a long way, and I love that you can use this one just about anything! 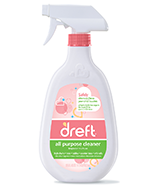 Dreft Gentle Clean Multi-Surface Spray is formulated to effectively clean the surfaces your child touches, which means pretty much everything. Everywhere. All the time. Like toys, glass, counters and super-expensive things they shouldn’t touch but do anyway. Last but not least is the Stain Remover. I was very impressed with this because I figured it could not be too effective since it is gentle enough for babies, however I was wrong! This is a very strong and powerful spray and works well on getting formula stains out, and grass stains out of my older sons jeans!